When all of these come together, a corrosion cell is created, leading to ions moving from the anode to the cathode, and degrading (corroding) the steel at the anode. Anodic and cathodic portions of the steel simply are part of any steel surface and they reside quite comfortably next to each other. The metallic pathway is obvious – it’s the piece of steel in which the anode and cathode reside. And the electrolyte is a liquid (often water) which connects all of these things together. The more active the electrolyte, the faster and more efficient the corrosion process – which is why salt and chlorides are so harmful to steel. They simply increase the conductivity of the electrolyte. In addition, chloride can concentrate under deposits and in crevices, creating a micro-acidic environment leading to aggravated pitting attack. Throughout history, the most common manner in which to deal with the issue of corrosion is by using paint, grease or some other material to prevent the electrolyte from coming into contact with the three other variables. In fact, for the most part, that’s all that paint does – it provides a barrier to prevent water from coming into the contact with the surface. But what if you can’t paint the surfaces that come into contact with liquids (electrolytes) or if they are too hot to support the application of a paint system, like the inside of a boiler? How do you stop, or reduce, corrosion in places that store liquid that can’t be painted or otherwise corrosion protected? The Romans, masters of water distribution, understood this problem and started using lead piping as far back as 11 BC. Lead did a great job of moving water, and it also didn’t corrode. But it did have a nasty side effect of making people sick, and some historians even believe that lead poisoning might have had something to do with the fall of the Roman Empire. You’d think that by today, we would have a good handle on corrosion issues inside of water systems. But in just the past few years (2,000 years after the Romans), serious lead contamination was found in the water system of Flint Michigan. And the culprit was purported to be mismanagement of corrosion issues within the water stream. Flint had purchased water from Detroit for decades, but in 2014 the city started using water from the Flint River, which was slightly more acidic. 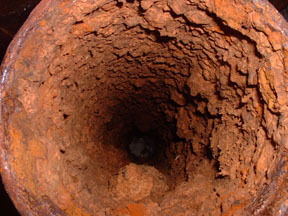 It was reported that failure to use an orthophosphate, which reduces corrosion in water pipe interiors, led to lead leaching out of the existing piping system. 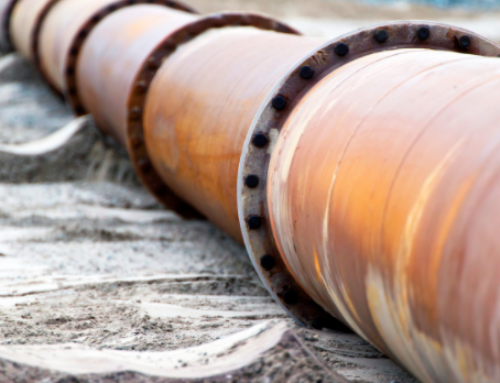 Managing water systems requires a completely different set of tools, and a technical understanding of managing water systems about where it’s possible to apply paint or apply cathodic protection. For just one example, let’s look at oxygen. Technically, oxygen should be included in the earlier list, along with anode, cathode, metallic pathway and electrolyte. It’s typically not included because (luckily for life on earth) it’s pervasive in the environment, and it’s a component of the electrolyte. There’s nothing that can be done about oxygen interacting with a bridge, as a large example. However, in many water systems, one of the main focuses of water treatment is to scavenge oxygen. But how does one identify what oxygen scavenger to use? In what concentration? And at what temperatures? How is the system monitored to ensure the scavenger is working properly and at what frequency? The more complex an issue, the more at-risk building and equipment owners and managers are. And the primary manner in which owners and managers procure these services are critical. Typically, they rely on the advice of water treatment companies to sample and test the water, and design a targeted water treatment protocol. These companies then sell packages which include chemicals, and often the equipment required to meter the chemicals into the system as well as monitoring of the water. The problem however, is that many of these firms are in the business of selling their own branded chemicals and systems, and often utilized their own internal testing labs. As a result, the risk to the owner is profound. It’s kind of like shopping for a cell phone, and walking into an Apple store and asking for a recommendation on the best phone for their particular need. The only thing you can be sure of, is that they will not recommend anything other than their own product. Such is the case with many water treatment companies. First, owners and managers can educate themselves about the functionality and requirements of their own water systems, whether it’s a cooling system, boiler feed or potable water. Secondly, owners and managers can engage the services of an independent, unbiased consultant who acts exclusively in the best interest of the client. The benefit here is that the owner is hiring a firm which has deep and broad technical knowledge and abilities within the water treatment industry, who will provide unbiased insights and recommendations to help ensure that systems are being properly maintaining, efficiencies are optimized, and risks of failures and health hazards are minimized. The team of experience consultants at Arthur Freedman Associates provides the experience, systems, tools, and knowledge to properly inspect systems, analyze failures, and make independent, technically-sound, forward-looking recommendations. We use only the services of independent certified laboratories, and we do not sell any chemicals, products or equipment.